Welcome to the Home of Hofstra Crew! Hofstra Crew is a group of talented, dedicated student-athletes who embody the values of their university and sport. Hofstra Crew is student run co-ed club team. As a group, we continue to meet the challenges of extraordinary performance that our coaches, teammates, Hofstra, and the sport of rowing have come to expect and demand. 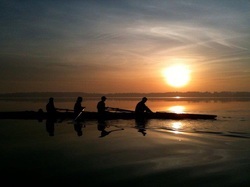 Check out the Roster Regattas & Results Page to see how the team is doing this season. Calling all Parents, Friends, and Alumni! Click Here to check out our Alumni page with some NEW team photos! Hofstra Crew is always looking for new rowers and coxswains to join the team. Want to do more for Hofstra Crew? Check out our donation page! Facebook: search "Hofstra Crew" and "Hofstra Crew Alumni"